Soon to be a feature film on Netflix, starring Sandra Bullock, and nominated for several awards in 2014, including the Bram Stoker, Shirley Jackson, and This is Horror (just to name a few). Something terrible has made is way into the world, but only those who have seen it can truly explain the phenomena. Too bad those who have seen it are driven into a violent rage that does not cease, creating a sense of insecurity with the outside world. Families are driven inside, boarding up and closing off any possibility of connection with humanity. One survivor, Malorie, has been planning for the day that she and her two children will flee their home in hopes of a safe haven. The day when they will journey downriver, blindfolded, with only their sense of touch and astounding hearing to guide them. What awaits them is unimaginable, and what follows them is unknown. I thoroughly enjoyed Bird Box for its originality and false sense of security. It is truly a novel where you are left with several unanswered questions, but are glad you were along for the ride. Malerman does a wonderful job creating characters that you can sympathize with and has developed one of the creepiest settings imaginable. I very much enjoyed how the past and present storylines were interwoven, showing that even with the passage of time, this phenomena doesn’t slow down. I can’t really think of any gripes I had with the book, except that it was relatively short and I wanted to know more. Overall, if you are in the mood for a great work of horror, look nowhere else. 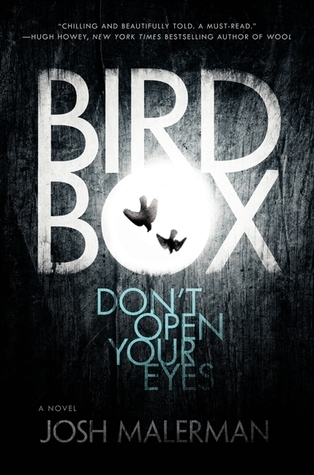 There is a reason Bird Box is being compared to The Road by McCarthey and to the likes of Stephen King. It is just that good. Definitely want to read this at some point. I can’t imagine anything scarier than trying to escape something blindfolded! Highly recommend it for the Halloween season! I loved this one! Horror books don’t really scare me like movies do, but this one definitely had me afraid to get out of bed at night. 😀 Curious to see how they’ll tackle the whole “blindfolded and claustrophobic” thing in the movie.